The people have been abused for so long they need a leader who gives them hope and a vision. Surviving from day to day is not a life. I was still suffering from a very mean tummy bug that had given me the worse diarrhoea I’d had in my life. Over the previous 2 days I’d eaten nothing. I’d drunk 2 Cokes and a litre or so of water as the Aztec Revenge swept through my system. I still felt weak and fuzzy headed. Outraged at the repugnant behaviour of the staff at the Viazul bus station in Havana. Cienfuegos Cuba was a refuge. The taxi driver found our casa regulares after a few stops and enquiring and a hug and a kiss from some ladies. The people are very friendly and engaging. For supper I ate a few slices of dry bread and a glass of fresh juice. The following day for breakfast the same as dinner but with some fresh fruit and a little honey and jam. This did not provide enough fuel for our walk to the town centres and I felt completely out of it. My eyes couldn’t focus and I was jittery and weak. Not enjoying the busy street and the activity. We sat in the park, I took a few photographs and e made our way back to our casa regulares (home stay) in 42nd Street. 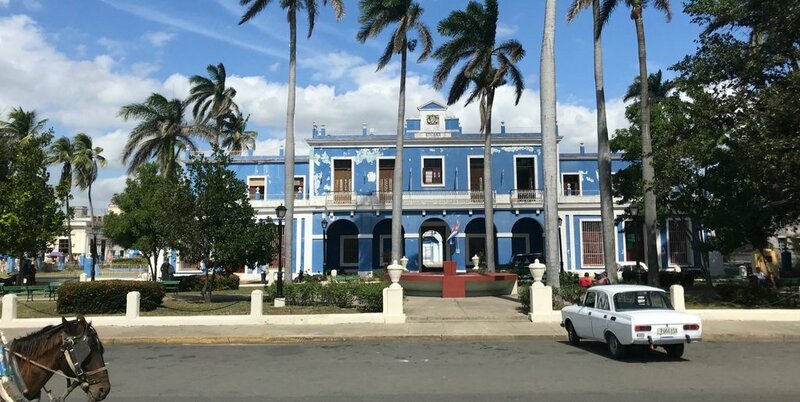 The buildings in Cienfuegos look different. The architecture more French than Spanish. The colours more pastel than vibrant. The character calmer and more relaxed. We took an organised trip arranged through Cabanacan. It was six hours over made up of two hours of travelling, about an hour or hour and 1/2 of free time, a 45-minute tour through the park and about an hour for lunch. The local cocktail is certainly worth a try. The drive was interesting, we drove through Camanayagua a dairy and coffee town and stopped in a town where the business seemed to be horses. Many houses in Cuba do not have glass pane windows but instead have metal louvres. These are very practical as they let in air ... but in mosquito areas also the mosquitoes! There are many houses been renovated and some even include a small shop. Although right next door can be a very neglected and shabby place. The roads are potholed and repairs are done in a very cursory fashion. There are many cork palms which are the national tree of Cuba. They provide wood for housing, the leaves for roofs, berries for the food for pigs and the centre spear food for people. There are also many trees that look similar to the South African baobab. One very appealing feature of many houses are the rocking chairs on the front veranda. We had some interesting discussions with other visitors. It is clear that Cuba has a lot to do to build a viable and attractive holiday market. In many situations with colectivo taxis people have felt vulnerable and uncomfortable. It appears that the only priority is to make a fast buck without any consideration of the long term consequences. Very low wages have driven people to take irresponsible decisions. There is hope for Cuba to dig itself out of history. The freedom to do this should be in the hands of the people not ideological politicians clinging on to some failed strategy.